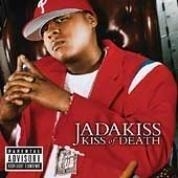 RapReviews.com Feature for June 22, 2004 - Jadakiss' "Kiss of Death"
With the recent (supposed) departure of Jay-Z, Jadakiss is one of the most apparent heirs to the King of N.Y. throne. He's paid dues with Yonkers-bred trio The LOX since 1998, and he's made memorable cameos with everyone from well-respected MCs such as Nas and Gang Starr to pop artists like Jennifer Lopez. With his raspy-voiced flow, unparalleled diction and penchant for always finding the right punchline, he's even proclaimed himself as "top five dead or alive, and that's just off one LP." That one LP received mixed reactions though. Kiss The Game Goodbye satisfied 'Kiss fans, with tracks like "Knock Yourself Out" and "Show Discipline" making it one of the streets' most listened to albums of 2001. Critics weren't as friendly, claiming that Jadakiss was trying too hard to satisfy all of his listeners. His "commercial" tracks were too commercial, and his street tracks stuck to the gangster-isms he was known for. And if it's all love daddy, why you come wit' ya 9? Why my niggas ain't get that cake? Why is a brotha up north, better than Jordan that ain't get that break?" and that's why my girl's here with me"
While the introspection is refreshing, 'Kiss is at his best when he's showcasing his punchline prowess and unparalleled delivery. He teams up with LOX brethren Styles P. over a spellbinding combination of climactic strings and thumping bass from producer Elite on "Shoot Outs," and his "Real Hip-Hop" collaboration with Sheek marks the true return of Swizz Beatz, with Swizz employing energetic strings and conga drums to set an incredible old-school funk. Kiss brings the expected A-List producers along for the ride as well, but even these established beatmakers reinvent themselves for Jada's efforts. While Eminem sticks with his ominous sound on the "Welcome To D-Block" LOX cut (along with a notable verse from Em himself), The Neptunes abandon their typical techno-tinged production and give Kiss "Hot Sauce To Go" with jazzy horns and a funky drumline, complete with Pharrell's popular falsetto for the hook. Kanye West even strays from his usual sped-up samples and employs dramatic strings, ridiculous percussion and light piano keys for the head-nodding "Gettin' It In," adding in his trademark cocky vocals to spare. While "Shine" (featuring Snoop Dogg and DJ Quik) leans on the generic side and "Time's Up" is terribly formulaic with Nate Dogg's hook and Scott Storch's Dr. Dre-esque production, even these tracks aren't complete failures, as they're likely to light up clubs this summer. Kiss of Death is the Jadakiss album that everybody's been waiting for, 'Kiss fans and critics alike. If efforts this complete continue to come from K-I-Double, he may only be baby steps away from the throne of NY.